Water (aqua), ethoxydiglycol, cyclopentasiloxane, methylpropanediol, steareth-2, cyclohexasiloxane, steareth-21, polyquaternium-37, propylene glycol, propylene glycol dicaprylate / dicaprate, PPG-1 trideceth-6, panthenol, allantoin, diazolidinyl urea, methylparaben, propylparaben, fragrance (parfum). I have lived this product for over a decade and won't use anything else to clear a pimple quickly. It's refreshing to be able to trust a product , as I feel it's rare to find something as good as advertised. 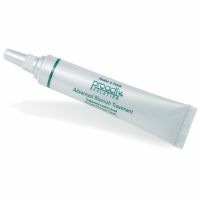 I recently used an Acnefree brand spot treatment, because I ran out of the proactive and was desperate. Well, That was an awful experience and now I'm dry, discolored and numb. TRY or STICK with this spot treatment. It's really good!! Prevents acne Gets rid of current acne fast Lightens scars Evens skin tone Drying I never though I'd touch proactive again since it burned my face in high school. I was researching Dan's benzoyl peroxide treatment and was on the verge of ordering it when I stumbled upon my little brother's advanced blemish treatment with 6% benzoyl peroxide. I have zero new pimples, my face is LESS OILY, and I couldn't be happier. I use it in the morning and night, after I wash my face. My skin is extremely oily and I think this dries it out enough so bacteria (and acne) can't live. It is miraculous. I wish I would've just tried it sooner.